Tales of Forgotten Subsystems, Part IV: The Sweating Mechanism. The sweating mechanism is truly one of the most forgotten parts of the human body. Its influence in our athletic performance is so great that it’s really a mystery to me why more emphasis isn’t placed on training and developing it. In a big way, our sweating mechanism is one of the things that sets us humans apart from the rest of the animal world. (The second sweatiest animal, the horse, only has about one-fifth of the sweat glands, per unit of skin, that we do). There must be a good reason we have a five-hundred percent sweating advantage over the next-best sweater in the animal world. And yet, not only do we gloss over this massive mechanism to focus on sexier components of athletic training, but we actively shun it in society. We deride people who sweat a lot, and turn the very act of sweating into a social faux-pas. Discussing that irony is an essay in itself. Sweating is one of the things that makes us human. It is intricately tied to a multitude of other traits that identify us among animals: why we have little to no hair covering our bodies, why we have big brains, and even why we stand erect. In Waterlogged, Timothy Noakes explains how these traits all come together in the human animal. As desert endurance hunters, it was necessary for humans to have big brains, in order to think abstractly and plan pursuits that would last for many hours into the future. But big brains aren’t enough. The air that’s closest to the ground (where most four-legged animals live) is also the hottest. In that hot air, the human brain—our supercomputer, the reason we outclass every other animal on the plains and otherwise—will overheat, and force the body to halt all athletic activity. So how did we get around this problem? In two ways: First, by standing up. 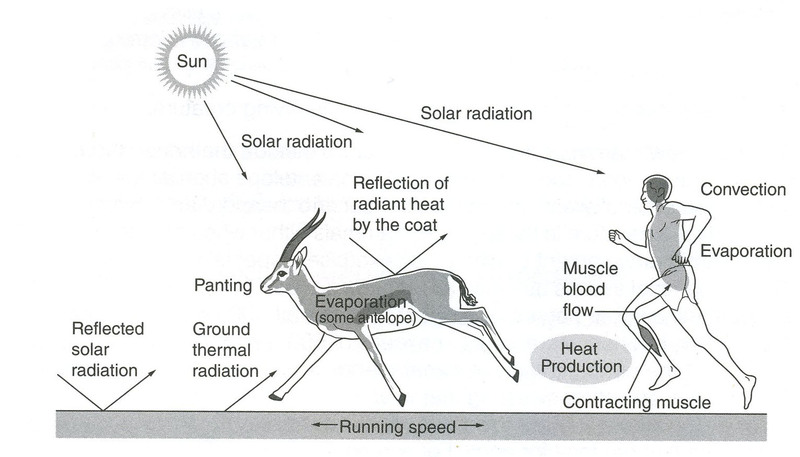 This not only takes our center mass outside of the hottest part of the terrain, but it also puts our body in a vertical position, meaning that, during the hottest part of the day, we have much less surface area exposed to direct sunlight (than say a deer). Second, by dramatically increasing the amount of sweat glands, we can take advantage of the wind. Because our skin is uncovered, sweat lets the wind take heat directly from our skin, resulting in massive convective heat loss that other animals just can’t match. From “Waterlogged: The Serious Problem of Overhydration in Endurance Sports” (Noakes, 2012). (When an animal’s skin is covered by fur, the majority of their body heat remains trapped in that fur layer, and never gets exposed to the wind). In other words, while most animals were “designed,” if you will, for heat retention, we humans were “designed” for heat loss. Talk about natural athletes. Thanks to this confluence of extraordinary adaptations, we can bring the rest of the features of the human body—our pack dynamics, our nimble physique, our massive aerobic engine, and the supercomputer that allows for productive, recursive symbolic manipulation (the human brain)—to bear on the hunt. Given all of this, it’s amazing that we think of ourselves as frail, sedentary creatures. We are the athletes of the animal world, being able to run down just about every ungulate but camelids (llamas, camels, etc.) because we can’t drink saltwater (while most desert ungulates can), because we choose slow (and relatively inefficient) two-legged propulsion over quick and efficient four-legged propulsion, and because we play hardball with the desert climate—betting our internal water on the idea that we’ll be able to chase down that deer and still be able to replenish the water we lost. We take all of these apparent disadvantages and use them to our advantage. And we can run down these “athletic” animals because our brains use 20% of our oxygen and 16% of our energy. (Comparatively, the brains of other mammals use between 2 and 10% of their total energy). The powerful sweating mechanism lets humans act like that annoying poker player a lot of us know—while everyone else at the table is betting in a friendly, conservative manner, they’re changing the rules, out to make money, constantly going all-in. Our sweating mechanism lets us fundamentally change the game. While other animals are stuck playing conservatively, trying to lower their body heat in a body designed for scarcity—a body that is all about water retention and heat retention (to save energy in the long run)—we humans exploit this conservative game: we force animals to play by our rules. It’s just like that poker game: because other animals can’t spend water fast enough, we humans play our aggressive game, betting that they’ll run out of chips before we do. Next time we run in the heat, let’s remember this. When it’s so hot that running becomes uncomfortable, let’s remember that by unlocking our sweating capacity—by training the sweating mechanism just like we’d train any other muscle—we’re developing a crucial component of our athletic potential. Also, we’re getting in touch with one of the very things that makes us human. Previous PostCheating on Fitness Trackers, explained in systems.Next PostThe systemic nature of obesity, and a few of its socio-economic feedback loops.